MEAD magazine sanctioned mead competitions: are not only about sampling quality mead but is also a mead competition. Mead makers enter their mead to be judged by Certified and non certified Judge Panel. Festival attendees can also sip the mead entered in the competition during the tasting sessions. MEAD magazine invites industry professionals from around the region to sit together in small groups and, without knowing the brand name, taste mead in each specified style category. The ultimate goal of the Judge Panel is to identify the meads that best represent each mead-style category as described and adopted by the Panel. The Judge Panel awards gold, silver or bronze medals that are recognized around the world as symbols of Mead Making excellence. These awards are sure to be among the most coveted in the industry and heralded by the winning Mead Masters in their national advertising. Different judging sessions take place over the day of the festival. Judges are assigned meads to evaluate in their specific area of expertise and never judge their own product or any product in which they have a concern. Awards for competitions: gold, silver and bronze medals for excellence in a multiple of style categories but does not necessarily award medals to the top three finishers in a particular category. When judges decide a category contains three excellent examples of the style, they award gold, silver and bronze medals for the first, second and third place meads, respectively. To find out more about MEAD magazine sponsored competitions. The Charter Oak Mead Cup is a MEADmagizine sponsored event the Cup will award gold, silver and bronze metals for excellence in the following style categories Traditional, Cyser, Melomel, Pyment, Carbonated. Overall Impression: Similar in balance, body, finish and flavor intensity to a dry white wine, with a pleasant mixture of subtle honey character, soft fruity esters, and clean alcohol. Complexity, harmony, and balance of sensory elements are most desirable, with no inconsistencies in color, aroma, flavor or aftertaste. The proper balance of sweetness, acidity, alcohol, and honey character is the essential final measure of any mead. Aroma: Honey aroma may be subtle, although not always identifiable. Sweetness or significant honey aromatics should not be expected. If a honey variety is declared, the variety should be distinctive (if noticeable). Different types of honey have different intensities and characters. Standard description applies for remainder of characteristics. Flavor: Subtle (if any) honey character, and may feature subtle to noticeable varietal character if a varietal honey is declared (different varieties have different intensities). Residual sweetness levels are minimal to none. Dry finish. May have more noticeable acidity due to low sweetness levels. Tannin levels may make a sweeter mead seem dry. Sulfury, harsh or yeasty fermentation characteristics are undesirable. Standard description applies for remainder of characteristics. Mouthfeel: Standard description applies, although the body is generally medium to light (but not watery). Note that stronger meads can have a fuller body. Sensations of body should not be accompanied by noticeable residual sweetness. If judges believe that no mead in the category meets the quality and style-accuracy criteria, they may elect not to award a medal. Judges may award a mead with a silver or bronze medal and yet not award a gold medal. A world-class mead that accurately exemplifies the specified style, displaying the proper balance of taste, aroma and appearance. An excellent mead that may vary slightly from style parameters while maintaining close adherence to the style and displaying excellent taste, aroma and appearance. Thank you for your interest in the Charter Oak Mead Cup. This this collaborative effort of our sponsors. please show your appreciation by spreading the word of the event and follow the sponsors on your favorite social media. Purchase 1 ticket for each mead entry. (2) 750ml or (4) 375ml required for each entry. Photo copy purchased ticket(s) and afix to bottles of meads to be judged. 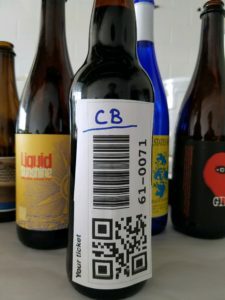 Clearly write category code on the ticket attached to bottles. Bring original ticket to event if you plan to arrive for judging. Complete registration form. Include unique ticket identifying number(s). 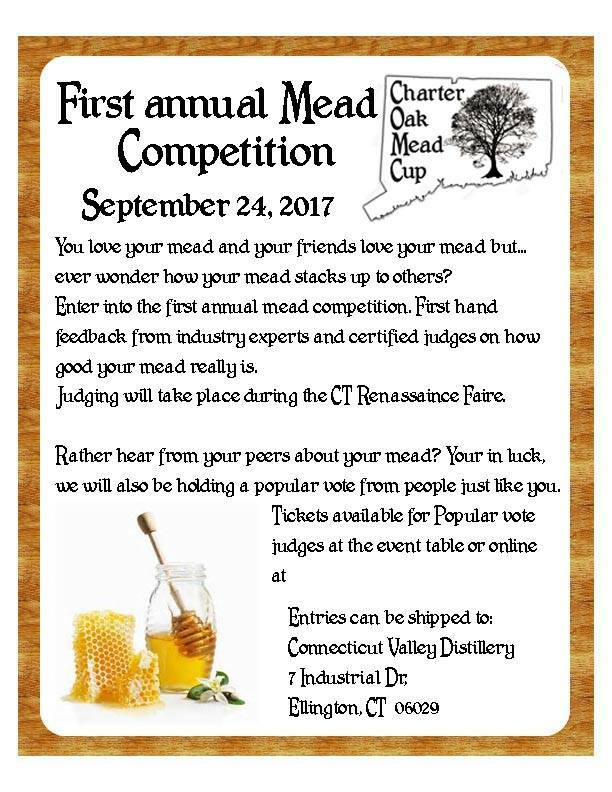 All Mead submissions must be received by no later then September 22, 2017 at 5pm. Mead Profile: For Best Judging Considerations and Placement, You May Include: SG, FG, Honey Type, Ingredient Used, Abv%, Yeast etc.